James Tyrwhitt-Drake from the NIH 3D Print Exchange uses the Formlabs 3D printers to create biomedical models. The NIH 3D Print Exchange is a library of 3D models that push the envelope of scientific visualization. Scientists and the public can use the 3D Print Exchange to find or generate scientifically accurate models to download and print. In college, James started using the Formlabs 3D printers to print proteins and other scientific structures that he found interesting. He discovered the NIH 3D Print Exchange through a post on our forum. 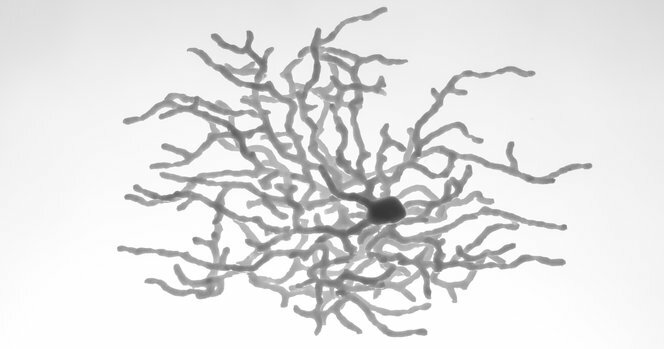 On their website, he found a model of a neuron created by the EyeWire project, an online game that crowdsources image segmentation of electron microscopy data. He thickened the structure and printed it on a Formlabs 3D printer, which was the first time its complex geometry had been successfully printed on a 3D printer. Prior to 3D printing, representations of microscopic or anatomical objects were often limited to images or a digital model on a screen. With desktop stereolithography, it became possible to create models that take advantage of the natural ways that humans perceive 3D structures. 3D printing offers another dimension to communicating scientific information. The high-resolution that stereolithography 3D printing has to offer allows the NIH team to print models that are scientifically accurate and medically applicable. SLA can be used to create the intricate details and overhangs of proteins, viruses and cells. These models can then help scientists plan surgeries, design drugs, and determine how proteins interact, as well as provide a new look into our biological world. James Tyrwhitt-Drake is a scientific visualization specialist at the NIAID Office of Cyber Infrastructure and Computational Biology, as a contract employee through Medical Science & Computing, LLC.